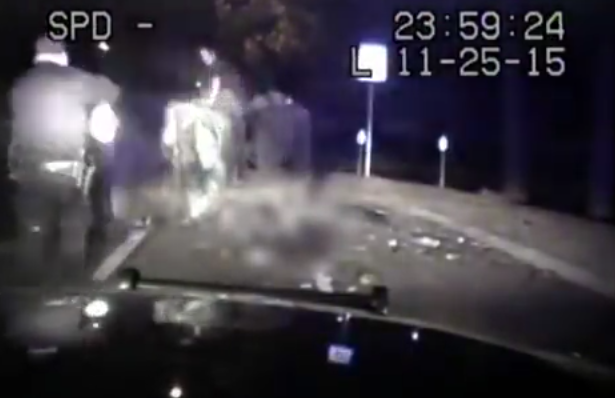 California officer shoots suspected drunk driver in dashcam video. Officer Patrick Feaster and Andrew Thomas in dashcam footage. Thomas was hospitalized shortly afterward and remains in stable condition. He will be charged with DUI manslaughter in his wife’s death. Butte County district attorney Mike Ramsey says Feaster will not be charged because the shooting, which Ramsey described as “not justified but also not criminal,” was accidental. Though Thomas has a fairly long rap sheet, there does not appear to be any suggestion that Thomas was armed or even that Feaster thought he was armed.